The Volvo XC60 and V60 are capable vehicles in both their segments, but having driven both of them back to back and comparing their specs, I can't imagine why one would spend more on the crossover than the wagon. Here lies, in my opinion, a strong business case to consider wagons over crossovers. To be clear about one thing, loving wagons doesn't mean you have to hate crossovers, and vice versa. If I were to find one defense for the crossover, it's the step-in height for older drivers and passengers. I'm fortunate enough to have two living great-grandmothers in their 90s, one of whom drives an Escape and the other who rides in my aunt's Escape. Neither of them are physically able to constantly get in and out of a lower-sitting car, pickups aren't functional for their needs and true SUVs are too expensive. That said, I fully understand the enthusiast disdain for crossovers. Most buyers (I'd agree) buy them for the perceived safety, they dilute the heritage of popular brands and, in some circumstances, take away the R&D dollars from fun projects. But, as TTAC's Derek Kriendler tweeted, few wagon defenders put their money where their mouth is when it comes to advocating the product. Cries from the wagon faithful are drowned out by consumers who want the crossover. But strangely — intentionally? — Volvo is able to split the difference with the V60, maybe at the expense of the XC60. The V60 came with a 2.0-liter, inline-four that makes 240 horsepower and 258 lb.-ft. of torque. The XC60, has the same twin-turbo, four-cylinder 2.0L that makes 302 horsepower. On the surface, those numbers look capable. But I don't know what happened and where all that power is going, but it didn't do much for the XC60 here. It has some low-end torque, but chokes around 3,000-4,000 RPM. Getting it to, say, 70 mph was more of a struggle than it should have been. Steering on the XC60 was unusually stiff. You know those sit-'n-spins you used to play with? Not the one your kids play with now. The one you played with. The really heavy ones. Yeah. You were not a super-strong kid growing up. You had to put in a little muscle to get that damn thing to turn. That's how it was getting the XC60 around some of Las Vegas' curves. Not only that, XC60 had trouble snapping back in line coming off most curves. I'm going to chalk that up to the XC60 being heavier and harder to push around. The XC60 has all of the same safety features as the V60 (blind-spot assist, backup camera, a low-speed collision-avoidance system and audible alerts for parking) plus adaptive cruise control, lane-departure warning, forward collision warning with auto-braking, pedestrian and cyclist detection. It's typical safety-in-a-box for Volvo, but not necessary if you prefer the less-optioned V60. A few of you asked in the V60 review about the cabin space, especially in the rear. Well, the XC60 has the V60 by that because it's taller. But it's roughly the same space between the liftback and the backseat, and the seats in both vehicles easily fold down the same way. Trunk space aside, I had the same amount of legroom in the XC60. One would think that the crossover would provide more room, but I had the same headroom and legroom all around both models. It's here, I wonder, if it's worth spending the extra money on a crossover if you absolutely don't need one. The V60 has an MSRP of $35,300 while the XC60 starts at $35,750. To get a bigger vehicle for $450 might seem like a steal. But let's start adding things and factoring in some other numbers. The price of the XC60 is with the T5 engine. If you want the T6 — the one Volvo had us test — then you're looking at a starting MSRP of $40,050. All of those prices are without all-wheel-drive. An AWD V60 starts at $36,800. An AWD XC60 isn't available with the 2.5, but is available with Volvo's 3.2L for $37,250. With the T6 we tested, an AWD XC60 jumps to $41,550. If you want to compare just the two models we tested — toys and all — it's $35,300 for the V60 and $40,050 for the XC60. So what are you paying $5,000 extra more? Basically some extra trunk space and woodgrain in the center console. The value in the V60 can also be found in the fuel economy: While the V60 gets 25 city/37 highway with FWD (20/29 with AWD), the fatter XC60 doesn't measure up regardless of which engine you have. The XC60 gets 24/31 with a FWD T5, 18/25 with the 3.2L and, in the T6 I tested, 22/30. The XC60 is not a terrible vehicle. It is attractive, it is full of things to keep you safe, it's a relatively affordable premium crossover that offers more perks than other kid-haulers on the lower end. 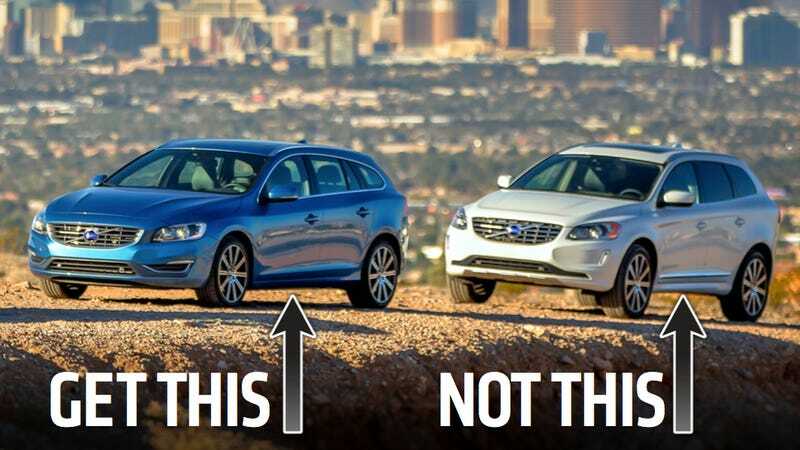 It just doesn't compare to the V60, which offers all the same perks without the "perceived safety" of being a crossover. But in this case, you don't even need the perception of safety, since Volvo is bundling actual safety into the vehicle.